I love empanadas, probably because when I was 12, we lived in Venezuela for two years. It was a two-year vacation that I will never forget. My parents learned to golf there - a whole other story! We would go to the golf club with them and swim and have snacks. The empanadas were to die for. I only remember the meat and potato ones. I have never found any I like as much as those, but I do love cheese - who doesn't? 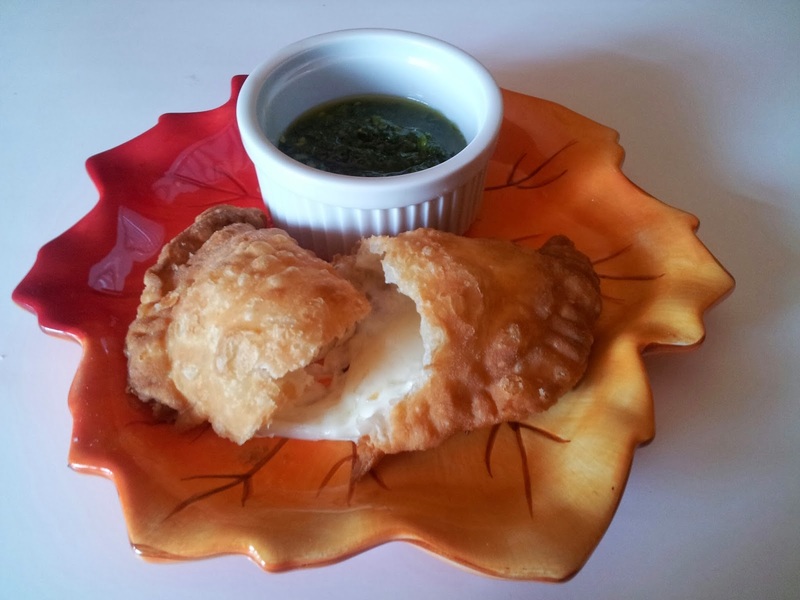 The dough for these empanadas is made with lard. I know. Who uses lard these days? I am sure my grandmothers did and they both lived to a ripe old age. So, for an occasional special treat, make these! If you aren't comfortable working with dough, Goya also makes empanada discs, found in the frozen aisle of your grocery store. I have some in the freezer, but I haven't used them yet. They will come in handy for a quick appetizer or lunch. This recipe makes a lot of dough, so I filled some with cheese and then froze them, unfried, on a cookie sheet, and then transferred to freezer bags for later. I also filled some with peach pie filling and with a caramelized banana filling, and after frying I rolled them in cinnamon and sugar. If you like, you can also freeze the dough. Roll in to a ball, wrap tightly in plastic wrap and then put in a freezer bag. The options are limitless. Add the flour and salt to a food processor and mix to combine. Cut the cold lard into pieces so it will incorporate faster. Pulse until it mixes with the flour. Slowly pour the warm water thru the tube of the food processor, and pulse until the dough comes together. Move dough to a floured mat or counter. Knead until smooth. Divide dough in half and wrap one in plastic to keep it moist. Roll the other half out until it is about 1/8 – 1/4” thick. The thinner, the better. Using a large biscuit cutter, or the underside of an empanada crimper, cut out the circles. Fill each circle with 2-3 Tablespoons of cheese, being careful not to over-fill. Moisten edges with water and crimp with a fork to seal or seal using an empanada crimper. Add about 4” inches of vegetable or canola oil to a large pot. Once oil reaches 350°F, add the empanadas and cook until golden brown, about 4 minutes (2 minutes per side.) Depending on the size of your pot, you will be able to cook 4 to 6 at one time. Do not over-crowd the pot. When golden brown, remove and set on paper towels to drain. Serve as is, with chimichurri or marinara sauce. They are great all ways. Note: I suggest using whole milk mozzarella, usually found in a ball or a log, and grating it yourself, as opposed to buying a bag of shredded cheese. Add garlic cloves and onion to food processor. Pulse until finely minced. Add the parsley and cilantro and pulse until minced. Transfer to a bowl and add the olive oil, lime juice, salt and red pepper flakes. Stir well and put in refrigerator until ready to use. This is also great with flank steak or skirt steak.